Welcome to tour Treasure Hunt Event rules. 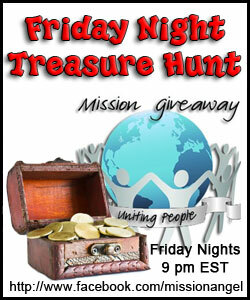 Be sure to head over to the Mission Angel Facebook page by 9pm est and start watching for the lineup of participants. It will be best to keep the Mission Angel page open in a separate tab or page. Every 10 minutes, you will be given the link to a Facebook page. Make sure you “like” that page and then look for them to post a link to their giveaway post. Each page will post a link to a giveaway, on their blog, that will include a giveaway entry form. There will be 1-2 entries. The Giveaway Form will close at Midnight est. Once you have entered, return to the Mission Angel page and see who the next participant is. Remember a new link will be posted every 10 minutes. You can enter each giveaway, no matter how many there are! The winner will be contacted within 24 hours with instructions on how to claim their prize. That’s it! Just hop from page to page and enter all of the giveaways. No prizes will be valued at less than $5. DISCLAIMER: Mission Giveaway and Mission Angel are not responsible for prize fulfillment. Each blogger is providing their own prize and is responsible for timely fulfillment. Entrants must follow the contest rules for each individual giveaway and meet individual requirements for prize eligibility.